With the holiday’s coming many of us will be having friends and family stopping in to enjoy food and festivities. With more people, comes more bathroom visits! In getting together your grocery list, errands list, and honey-do list, you may not think about how your septic system can handle those extra bathroom visits. I mean really, you don’t want to have a septic “episode” in the middle of your family digging into great Aunt Martha’s sweet potato casserole! So, how do you prevent this catastrophic event from happening? 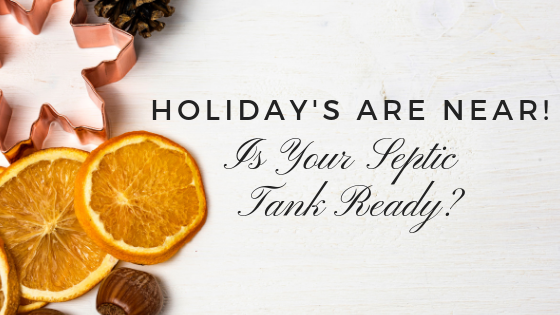 You may need to get your septic tank pumped. Why Do I Need My Septic Tank Pumped? Like anything in the household that is used daily, it needs to be serviced. From our fridges that need to be cleaned out weekly, to a service call for your AC, it’s just part of homeownership. Unfortunately, many times we don’t think about these things until we are in crisis mode. For septic tanks, solid waster builds up overtime creating deposits on the top and bottom of your septic tank. These deposits cause extra stress to your system. Without proper pumping and maintenance, you could be facing a costlier fix to your septic problems. Some homeowners think adding additives purchased at Wal-Mart or Home Depot, work just as good. These additives, that work to break down bacteria, can cause more harm then good. Nothing can replace getting your septic tank pumped. A good rule of thumb is to pump your septic tank 1 to 3 times a year. How often you pump your septic tank can depend on how old your system is and how many people are using it. Has your shower been draining slow? Have you noticed back up in the kitchen sink? Has your toilet been spinning spinning and taking its own sweet time flushing? No use denying it, it’s time to call in a professional to pump that septic! These all are warning signs you do not want to ignore. Like any problem that gets ignored, it doesn’t go away. It gets worse. Have you noticed an odd swampy odor in the area of your septic? That’s a sign that your septic is filling and those gases have nowhere to go but to seep out. It’s bad enough they can seep out around your septic, they can also start smelling up your house wafting from the toilets and drains. Do you see that patch of fine looking grass, in a field of dry brown and hibernating for the season grass? Well, that means your septic has seeped up into your lawn in extra waste liquid. Not only is this gross but this is hazardous to your families health. If there is standing water in your yard, your septic tank is full and needs to be drained ASAP. Getting your septic drained and inspected can help you get your yard back in order and hopefully, if done in time, save you costly repairs. Yep, that’s us. We do a lot of things. We recycle grease, we offer conex trailer rentals, we do lush portapotties for events, but what we’ve always done, is septic. We’ve are the best septic service in South and North Carolina. Call us today to find out what we can do to help you get ready for all the family without worrying about an epic septic issue that generations to come will talk about.